By WPH SR Writer, Dave Fink- 10 minutes has passed since the last point was played, a controversial call that went against Timbo to end the first game of a highly anticipated WPH Outdoor Player’s Cup quarterfinal against Juan Santos, one of the game’s greatest stars. Timbo eventually reemerges, his impassioned outburst of 10 minutes ago replaced by a more subdued murmur. Timothy Gonzalez does not play handball for recreation. Or as something to do on weekends. Or after work. Handball is his work, his livelihood. He does not play most days. He plays every day, all day and into the night. He plays whoever will play him. Two on one. Left to two. Handicap doubles. He will play you for virtually any odds at any time. In the instance there is no one to play, he practices by himself. For hours. Starting the game of 1-Wall big ball at the age of eight, Timbo quickly became addicted to the sport. He also quickly became one of the game’s greatest 1-Wall players, challenging the game’s top 1-Wall stars Rookie Wright and Gio Vasquez by his mid teens. At 22, he still considers Rookie and Gio to be his biggest 1-Wall rivals. Losing to then 40 year-old Rookie in the 2013 finals of 1-Wall big ball’s most prestigious event, the King of the Courts, looms as his greatest disappointment on the handball court, a testament to his respect for his rival. 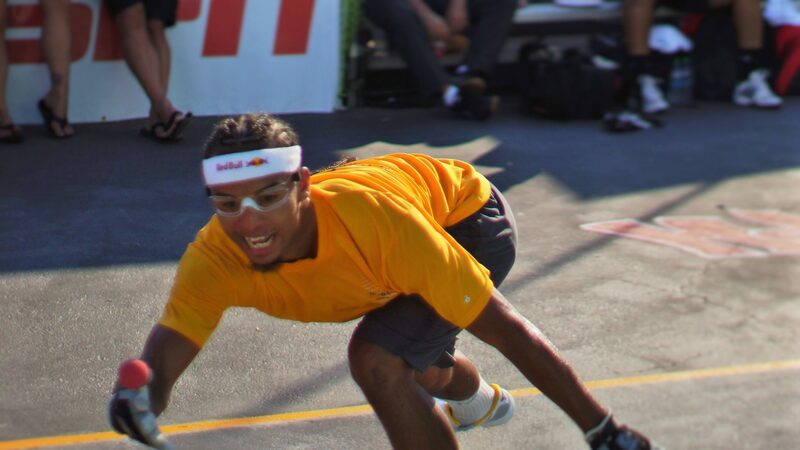 Defeating Rookie and Gio in the semifinals and finals of the 2011 USHA Big Ball 1-Wall Nationals remains his greatest accomplishment on the handball court. His game is electrifying. His personality is polarizing. Every match is must see, not only for his skill and tenacity, but also for his bravado and flair for the dramatic. Part Nadal and part McEnroe, Timbo combines unparalleled two-handed power and spectacular athleticism with wildly entertaining antics and an always unpredictable spectacle. Relishing the energy from the crowd, Timbo loves to put on a show. He is a throwback athlete, one that wears his emotions on his sleeve. You know what he is feeling at all times and as a spectator, you feel every point with him. Timbo brings not only unbridled passion and showmanship to every match, but also cross over talent that is unmatched in the world of elite handball. Already the undisputed number one player in 1-Wall big ball handball and king of New York City handball, Timbo set his sights on 3-Wall big ball supremacy. Despite only playing 3-Wall big ball sporadically for less than a year, Timbo ousted three of the top ten WPH Outdoor Player’s Cup pros at the 2013 WPH/WOR 3 Wallball World Championships en route to a semifinal clash with WPH Player’s Cup number one Samzon Hernandez. Despite his glaring 3-Wall deficiencies stemming from his lack of 3-Wall experience, Timbo still pushed Hernandez to the brink of their first game in the semifinal showdown, earning the honor of “2013 WPH Match of the Year” in the process. Timbo has since honed his 3-Wall game, playing in three Player’s Cup Stops in 2014 and proving that he is not only freakishly gifted on the handball court but highly adaptable as well. Timbo would very likely be a major factor in all codes of handball, given the motivation and desire to play. Timbo makes the 3,000-mile trip to WPH Outdoor 3-Wall Big Ball Player’s Cup events a week in advance of the tournament. While most players arrive to a tournament the night before or even the day of the event, Timbo arrives a week early to acclimate to the courts and the conditions. He wants to understand every nuance of the court and how the conditions will factor into his strategy, much like a golfer that arrives to a tournament a week in advance to chart the course and figure out the speed and undulations of the greens. His motivation comes from his enjoyment of the game, the intensity the game requires and the unequaled workout that handball demands. Undeterred by failure, Timbo relishes the opportunity to learn from his losses and return stronger. His marked love for the game and unrivaled success over the past five years landed him a sponsorship with Red Bull, becoming the first and only handball player to be sponsored by Red Bull, a company that has sponsored former number one tennis star and two-time Grand Slam champion Victoria Azarenka, as well as racing teams and the top extreme athletes in the world. Timbo is recognized on Red Bull billboards across New York City and promoted alongside international superstars in the world of sports. While titles and striving to be the best are important to him, it is his young son Jayden that trumps anything he could ever do on the handball court. Becoming a father in his late teens, Timbo embraces his responsibility as a role model and a parent. Regularly wearing jerseys with Jayden’s name printed on the back, young Jayden is often in the gallery cheering for his dad, something Timbo values far more than any title. Timbo also dedicates significant time to inspiring the next generation of handball players, hosting numerous youth clinics in New York City throughout the year to provide the opportunities for fun, discipline and the physically active lifestyle that handball has afforded him. Timbo will embark upon his quest to capture his first ever WPH Outdoor Player’s Cup singles title at the Player’s Cup Player’s Championship at the 2014 WPH/WOR 3Wallball World Championships at the Stratosphere Hotel and Casino in Las Vegas, September 11th-14th. The elite 16-man Player’s Championship field features the top 16 players from the Player’s Cup III season, including Samzon Hernandez, Juan Santos, Ricky Ruiz and many more. Timbo enters the Player’s Cup’s most prestigious event as the number seven player, an incredible accomplishment for a player that has competed on the WPH Outdoor Player’s Cup 3-Wall big ball circuit for under a year. Remarkably, Timbo was just a few points from entering the Player’s Cup Player’s Championship as a top four player, having narrowly missed an opportunity to defeat Samzon Hernandez in the finals of the Player’s Cup III Vegas LTE Stop #2 and coming painstakingly close to defeating Player’s Cup number two Juan Santo at La Mirada Stop #3. Regardless of whether he is able to capture his first ever Player’s Cup singles title in Las Vegas, Timbo’s matches will likely be the highlight of the event, as the largest and most vocal crowds will fill the Stratosphere’s bleachers to watch the greatest show in handball. It will be exciting. It always is.